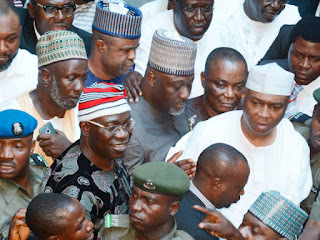 A war of words wednesday erupted between the Secretary to the Government of the Federation (SGF), Mr. Babachir Lawal, and Senate President Bukola Saraki as the SGF advised the embattled senate president to tow the path of honour and tender his resignation if he felt aggrieved over his ongoing trial in court for alleged forgery of the Senate Standing Rules. But in a swift reaction, the Senate replied that the trial of Saraki and his deputy, Senator Ike Ekweremadu, the upper legislative chamber was being assaulted. In a statement, Lawal also allegedly accused Saraki of dragging the entire National Assembly into his criminal trial, saying he and his Deputy, Senator Ike Ekweremadu, were standing trial as individuals over the forgery case brought against them by the Attorney General of the Federation (AGF). Drawing analogy from the case of the former Speaker of the House of Representatives, Alhaji Salisu Buhari, who resigned from office over certificate forgery allegations leveled against him, the SGF said the former Speaker did not drag the entire National Assembly structure into the debacle. He noted that both Saraki and Ekweremadu were alleged to have forged the Senate standing rules at the inception of the eighth Senate for which they were standing trial before an Abuja High Court. The SGF took exception to various aspersions being cast on President Muhammadu Buhari as being the brain behind the crisis in the National Assembly. According to him, “Since the arraignment of the two leaders of the Senate, they have issued two separate press statements conveying messages that are far from being complementary to the person and government of President Buhari. “Saraki in his statement clearly insinuated that the president is not in control of his administration and that a cabal now runs the federal administration. On the part of Ekweremadu, he insists that President Buhari is exhibiting dictatorial tendencies that can derail our democracy. “From their statements, the two leaders of the Senate also gave this erroneous impression that by their arraignment, it is the entire Senate and indeed, the legislative arm of government that is on trial. Lawal added that since the case is in court, the judiciary should be allowed to do its job, saying it is important to emphasise that the case involves only the four accused persons and should not be presented to the unsuspecting public as involving the entire Senate. “A case of forgery is usually preferred against individuals. This is not different. As was the case with a former Speaker of the House of Representatives, who was accused of certificate forgery; what he did was to resign, honourably. According to the SGF, the complaint leading to the forgery investigation was reported to the police by some aggrieved senators who specifically accused certain persons, stating that the matter before the court was neither that of the Senate nor the House of Representatives. “To bring the National Assembly as a body into this court case is totally unwarranted. It can only be for other purposes and reasons outside the investigation and legal proceedings,’’ Lawal added. He also said the separate statements by the Senate president and his deputy were contradictory, noting that while Saraki believes President Buhari had abdicated his powers, and that a cabal was in charge of federal administration, Ekweremadu said Buhari had become a dictator. “Our democracy is still evolving and deepening. The provisions of the separation of powers are entrenched in our constitution and should guide everyone’s conduct. “The rule of law is indeed supreme. This particular case is before the judiciary and is not being decided by the executive arm of government. All that has transpired is still within the confines of our laws. “These are the rights to accuse, to be investigated and be arraigned before the court. To impute other considerations to the process is unfortunate. We should allow the process to take its course in consonance with the dictates of the law and total obeisance to the cardinal democratic principle of the separation of powers,” Lawal noted. But in a statement by the Chairman, Senate Committee on Media and Publicity, Senator Aliyu Sabi Abdullahi, he said it was the upper legislative chamber that was being assaulted by the trial of Saraki and Ekweremadu. According to the statement, “We note in the statement issued by Lawal that the Senate is not the one on trial in the forgery case instituted by the AGF against the senate president and his deputy. “We disagree with him on this position and we maintain our earlier stand that it is the Senate that is the target of the present attempt to intimidate the legislature to force a leadership change in the Senate. “Lawal should tell us how reasonable it is to conclude that when the president of Nigeria and the vice president are being jointly tried in a suit which outcome can remove them from office, if it’s not Buhari government that is being targeted. “Is it not also imperative to clearly state that contrary to the claim by the SGF that Saraki nor Ekweremadu were mentioned by the petitioners, the statements by those interviewed by the police or even the police report. “Meanwhile, let us refresh Lawal’s memory about the facts of the 1999 case. It is obvious that the Senate president and his deputy are not being accused of certificate forgery as it happened in ex-Speaker Salisu Buhari’s case. "Therefore, nobody should compare an apple with an orange. Also, neither Saraki nor Ekweremadu is below the age requirement for their present position as it was alleged in Speaker Buhari case. Attempts to make the two situations look similar is to present all Nigerians as having no sense of history. We also know that nobody can be accused of forging his own signature." "The executive is in no position to determine the correct Standing Orders of the Senate. The Senate president and his deputy were as at the morning of the June 9, 2015 inauguration of the Senate mere Senators-elect and could therefore not have been in a position to influence any alteration in the rule book." Abdullahi added that: “The Senate as an institution, and indeed the National Assembly, has spoken about its understanding of the present assault on their independence by the executive. We maintain that this trial was a design by the executive to criminalise the internal affairs of the Senate to create a distraction for the leadership of the Senate, force a leadership change and cow the legislators.